A scheme of arrangement (also known as a “scheme of reconstruction”) is an agreement, between a company in financial distress and its creditors, to assist the company to fulfil its debt obligations. A scheme of arrangement works by restructuring the company’s debts and varying creditors’ rights. For example, the creditors may agree to claim only a portion of instead of the full amounts owed to them by the company. In exchange, the company may commit to paying these portions of debt rather than defaulting on the entire debt altogether. The scheme is subject to the Court’s supervision and sanction. This means that a scheme will be binding on all creditors if the Court approves of it – even if not all the creditors approve of the scheme. Why Undertake a Scheme of Arrangement over Judicial Management? Where the company and/or the creditors seek to leverage the possible orders that the Court may grant in order to achieve their desired ends. 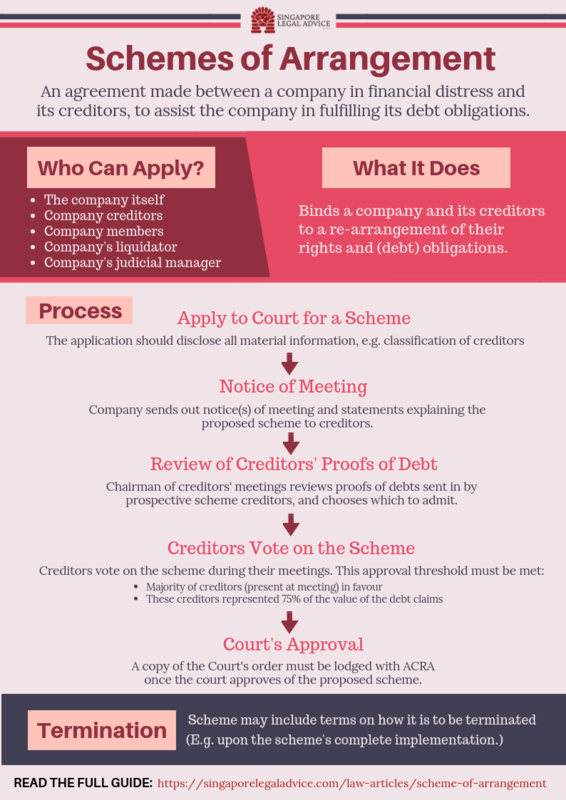 The following infographic summarises the process of obtaining a scheme of arrangement in Singapore. You may click on it to download it in a new tab. Who may apply for a scheme? When applying for a scheme, the applicant has to unreservedly disclose all material information to the Court. This is to assist the Court to decide how the creditors’ meeting would be conducted. Such material information includes any issues relating to a possible need to hold separate meetings for different classes of creditors. For example, where certain creditors have such different rights and interests from others that it will be inappropriate for them to consult each other on whether to vote for or against the proposed scheme. If the Court approves the creditors’ meeting, the company will send notice(s) summoning the meeting, as well as statement(s) explaining the effects of the proposed scheme to all creditors. Upon receiving these documents, prospective scheme creditors can submit their proofs of debt (together with any supporting documents) to the chairman of the creditors’ meeting. The chairman will then decide which debts to admit or reject. The chairman’s list of approved creditors – and the corresponding amounts of their admitted claims – will be posted at the meeting venue before the meeting. During the meeting, the scheme creditors will cast their votes on whether to go ahead with the scheme. As mentioned earlier, scheme creditors may be classified differently for voting purposes if they have differing interests. This classification is aimed at protecting minority creditors whose rights may be crammed down upon should they be outvoted. At the same time however, the Court has to ensure that not too many classes of creditors are created, or this could possibly lead to minority creditors being able to veto the scheme for no good reason. After voting, the chairman will tabulate the votes and announce the results. If more than 50% of the creditors or class of creditors (present and voting) holding at least 75% in value of debt claims agree to the proposed scheme, the Court will then decide whether to approve it. The scheme is one which a man of business or an intelligent and honest man, being a member of the class concerned and acting in his interest, would reasonably approve. The Court is satisfied that the scheme does not discriminate unfairly between 2 or more classes of creditors, and is fair and equitable to each dissenting class. 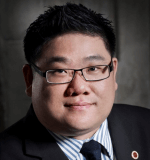 Once the Court has approved of the proposed scheme, a copy of the Court’s order must be lodged with ACRA. The scheme will then be binding on all creditors. The effect(s) of the scheme will depend on its terms. For example, rights of creditors can only be affected if the scheme has expressly provided for this. The same applies to the alteration of third-party rights. After a scheme has been proposed, the Court may grant a moratorium (i.e. a temporary suspension of a certain activity) to restrain further legal action or proceedings against the company in question unless the Court has granted leave for these proceedings to go ahead. For example, the company may apply to the Court to restrain the commencement of certain legal actions stated under section 211B(1) of the Companies Act (CA). One example of an order the Court can make under section 211B(1) CA is an order to restrain the passing of a resolution for the winding up of the company. Companies related to this company (e.g. its subsidiaries and/or holding companies) may also apply for a moratorium under section 211C(1) CA. For example, these related companies may apply to restrain e.g. the passing of a resolution for their own winding up. Restrain the company from transferring any of its shares or altering the rights of any of its members. Once sanctioned by the Court, a scheme of arrangement is binding on all parties to the scheme and cannot subsequently be altered. This is even if the company’s shareholders and creditors agree to alter the scheme. A scheme of arrangement can only be overridden by proposing an entirely new one and undergoing the whole approval process again. At the scheme manager’s discretion. Schemes of arrangement grant companies in financial distress temporary relief from their debt obligations. As not all creditors have to approve the scheme for it to go ahead, this avoids the impracticability or even impossibility of procuring the unanimous approval of all creditors. In certain situations, the scheme of arrangement may also prevent a minority of creditors from frustrating a beneficial scheme by withholding consent. If you need legal advice on whether your company will benefit from undergoing a scheme of arrangement, feel free to get in touch with one of our corporate and commercial lawyers.